KATHMANDU, March 21: Nepal Stock Exchange (Nepse) index jumped 42.19 points, or 3.05 percent, to close at 1,424.38 points on Monday. The stock market, which has been on a downward course for the last few months amid shortage of lendable funds in the banking system, has started to rise since the start of this week. After climbing to a peak of 1,881.45 points on July 27 last year, the market went into reverse gear, falling below the 1,200-point level at one point. Shortage of lendable fund caused share prices to fall as cheap finance facility, which was a major factor behind stock market, disappeared with the halt in margin lending by bank and financial institutions (BFIs). However, the stocks seemed to be recovering from this week despite the problem of credit crunch. “The rapid fall in stock prices has slowed in recent weeks and the marked seemed to be relatively stable. 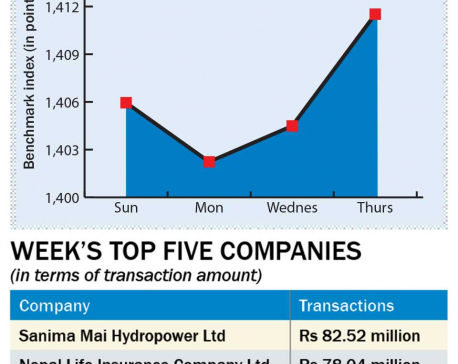 Share prices are rallying from the first day of this week as demand for stocks have started to rise,” Anjan Raj Poudyal, a former president of Stock Brokers Association of Nepal (SBAN), said. “Many investors, who had sold their holding to cash in on the stock boom and were in wait and watch mode, during the market downturn are now buying. This is helping share prices to rally,” he added. Poudyal also said that investors, who were thronging the primary market, are gradually returning to the secondary market. “Active investors have realized that it does not make investment sense to get few shares in the FPO where their huge money gets stuck for months. So they are buying from the secondary market. This has increasing buying pressure,” he added. Except Manufacturing and Processing group, which went down 5.12 points, all trading groups posted gains on the day. Insurance group logged the highest gains of 566.83 points to close at 7,197.53 points. The sub-indices of Hotels and Hydropower groups also went up 76.62 points and 44.21 points, respectively, to settle at 1,929.61 points and 1,743.69 points. Similarly, the Development Bank also ended 39.34 points higher at 1,529.65 points. Banking, the heavyweight trading group in the secondary market, also went up 29.13 points to close at 1,328.07 points. Finance and 'Others' groups also rose 18.02 points and 1.73 points to close at 641.66 points and 665.49 points, respectively. A total of 2.53 million units of shares of 140 companies worth Rs 1.27 billion were traded in the market through 8,122 transactions on Monday. Nepal Stock Exchange (Nepse) has selected Nepal Investment Bank Ltd, Siddhartha Bank Ltd and Prabhu Bank Ltd as new clearing banks. Issuing a statement last week, the stock exchange company said that three commercial banks were chosen to work as clearing banks following a competitive evaluation process. An evaluation committee formed by Clearing and Central Depository System Company Ltd (CDSCL) had recommended three banks to the board of directors of Nepse following a competitive evaluation process. Altogether, 11 commercial banks had submitted the letter of intent to work as a clearing bank. The Nepse had started the process to add three clearing banks following repeated instructions of the Securities Board of Nepal (Sebon). At present, only Global IME Bank Ltd has been working as a clearing bank for trading of securities.